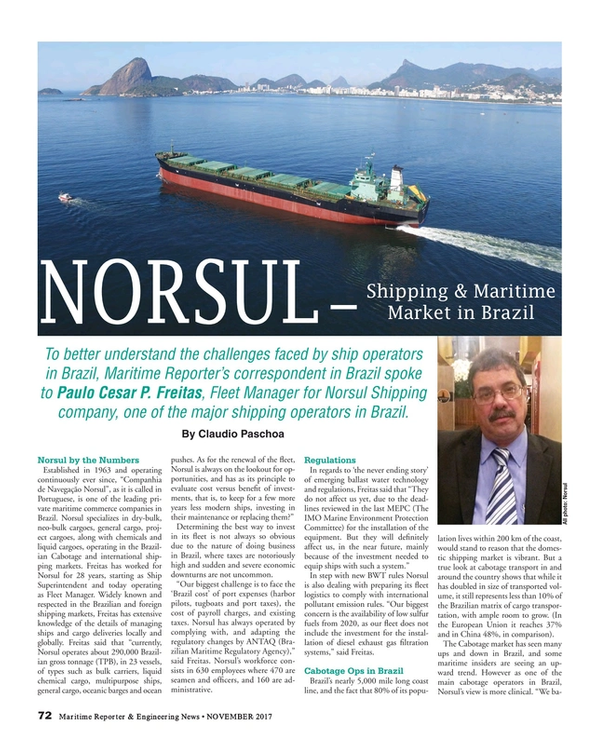 To better understand the challenges faced by ship operators in Brazil, Maritime Reporter’s correspondent in Brazil spoke to Paulo Cesar P. Freitas, Fleet Manager for Norsul Shipping company, one of the major shipping operators in Brazil. Determining the best way to invest in its fleet is not always so obvious due to the nature of doing business in Brazil, where taxes are notoriously high and sudden and severe economic downturns are not uncommon. “Our biggest challenge is to face the ‘Brazil cost’ of port expenses (harbor pilots, tugboats and port taxes), the cost of payroll charges, and existing taxes. Norsul has always operated by complying with, and adapting the regulatory changes by ANTAQ (Brazilian Maritime Regulatory Agency),” said Freitas. Norsul’s workforce consists in 630 employees where 470 are seamen and officers, and 160 are administrative. In step with new BWT rules Norsul is also dealing with preparing its fleet logistics to comply with international pollutant emission rules. “Our biggest concern is the availability of low sulfur fuels from 2020, as our fleet does not include the investment for the installation of diesel exhaust gas filtration systems,” said Freitas. Brazil’s nearly 5,000 mile long coast line, and the fact that 80 percent of its population lives within 200 km of the coast, would stand to reason that the domestic shipping market is vibrant. But a true look at cabotage transport in and around the country shows that while it has doubled in size of transported volume, it still represents less than 10 percent of the Brazilian matrix of cargo transportation, with ample room to grow. (In the European Union it reaches 37 percent and in China 48 percent, in comparison). The Cabotage market has seen many ups and down in Brazil, and some maritime insiders are seeing an upward trend. However as one of the main cabotage operators in Brazil, Norsul’s view is more clinical. “We ba sically operate in Cabotage, in Brazilian ports. We do about 500 stopovers in national ports per year, operating in almost all ports in the country. Cabotage is closely linked to the national economy. The future of the Cabotage market will depend on the recovery of the domestic economy,” says Freitas. Analyzing the main differences regarding the Brazilian maritime regulations in relation to the main countries that its ships visit, Paulo said that Brazil does have more onerous regulations than most maritime countries. “We basically operate in Cabotage and overseas carries. In Brazil, in addition to complying with the international regulations applied to any ship, we have regulations specific to various authorities, such as sanitary, environmental and labor, for example, burdening the cost of operating the Brazilian flag,” said Freitas. The cost to fly the Brazil’s flag makes it particularly unattractive to foreign operators, as situation that is unlikely to change anytime soon. The Brazilian shipbuilding market – like much of the world – is going through tough times. In Brazil the problem is perhaps more acute due to its reliance on oil major Petrobras for business, unfortunate at the moment because of the prolonged depressed pricing for oil that has seen the company pull-back on capital expenditures. The super-major’s restructuring is a result of prolonged low oil prices, massive debt and a well-recorded series of corruption scandals. As shipbuilding in Brazil settles into the ‘new norm,’ and as Petrobras orders continue to be minimal, many shipyards are looking at ship repair to cover costs. In some cases, the yards are even renting their berths to OSVs, for repair, loading and fitting out operations. Many shipyards in Rio de Janeiro and elsewhere along the coast have a number of OSV alongside. Many new shipyards, along with older, established yards, such as the Jurong shipyard, have turned to ship repair in order to stay in business. The Brazilian maritime industry had grown from 2,000 jobs to more than 82,000 between 2003 and 2014, according to Sinaval (National Shipbuilding Ship Repair Industry Union). Much of this increase in jobs happened in Pernambuco, which reached a high water mark of 17,000 workers in the sector, while today it has less than 5,000. The wave of unemployment intensified from 2014 onward, when the Petrobras crisis began to erode shipyard order books. Recent oil block tenders offer a glimmer of hope at the resurgence of local shipyards. Norsul, has also been at the forefront of an efficient system of pushers/sea-barges. “It is a very interesting system, unprecedented in Brazil, at the time of the beginning of its operations in 2003. It is inserted in the supply chain of the customer’s supply, and demands dedicated cribs for shipments and discharges, and that the time of embarkation and discharge is equivalent to the time of navigation between the ports. For example, look at the traffic of logs between the South of Bahia and Espírito Santo. Every 12 hours we have a barge being loaded in Bahia, a barge with logs being pushed south, a barge being discharged in Espírito Santo and an empty barge being pushed north. When arriving in Bahia, the pusher changes barge and drives south to Espirito Santo. Upon arriving in Espirito Santo, the other pusher changes barges and drives to Bahia,” said Freitas. It is interesting to note the main characteristics that make Norsul a successful navigation company in an unstable economy as sometimes is the case of Brazil. With over half a century of operations, Norsul has been through various stages of the fickle Brazilian economy and managed to survived survive and grow, which wasn’t the case with some defunct local ship operators. “Norsul, since its foundation in 1963, has been characterized by being a company that always seeks to be special to the market and to its employees. Norsul is recognized for delivering the transportation that is contracted, regardless of the variations of the navigation market, as well as to analyze each request and seek the best of logistics to serve the client,” said Freitas.